I’ve been in Yosemite for my annual Moonbow and Dogwood photo workshop. Monday night I took the group to Glacier Point for sunset—an unexpected benefit of California’s drought that allowed Glacier Point Road to open weeks earlier than normal. I knew a nearly full moon would be rising above the Sierra crest that evening, but figured that since it would be so far south, we wouldn’t be able to do a lot with it. But when I arrived Glacier Point and saw the moon rising above Mt. Starr King, I realized that shifting slightly south, away from the popular Glacier Point View, might just allow us to include the moon and Half Dome in a wide shot. Hmmm. But because we had people in the group who had never been to Glacier Point, I decided now was not the time for exploration. As always happens at Glacier Point on these predominantly clear evenings, the light on Half Dome warmed beautifully as the sun dropped to the horizon behind us. Organizing an expansive landscape into a coherent image can be difficult, especially for first timer visitors. But as I moved between the students positioned along the rail, it seemed that all were doing fine and realized that my greatest value at the moment was to stay out of the way. Appreciating the view, I just couldn’t get that moon, blocked by trees from our vantage point, out of my mind. When a couple of people in the group asked why I wasn’t shooting (it always makes them nervous when the leader is looking at the same view they’re photographing but shows no interest in shooting), I told them I was simply enjoying the view (quite true). But when someone asked if I had any suggestions for something different, my ears perked up. I told them if I were to be shooting, I’d go back up the trail a hundred yards or so to see if I could get around the trees and find something that included the moon. When several people sounded interested, I warned them that there’s no guarantee we’d find anything photo-worthy, and relocating so close to sunset would risk missing the show entirely. Much to my delight, a couple of people said, “Let’s do it,” and that was all I needed to hear. I told Don (Don Smith, who’s assisting this workshop—for those who haven’t been paying attention, Don assists some of my workshops, I assist some of Don’s, and we do a few workshops as equal collaborations) that I was taking a few people back up the trail and off we went. I ended up with five (nearly half the group) at the view just below the Glacier Point geology exhibit. I chose this spot for its open view, and for the way it allowed us to frame the scene with Half Dome on the left, triangular Mt. Starr King and the moon on the right, and Nevada and Vernal Falls in the center. With a couple of trees and dark granite for the foreground, the scene couldn’t have been more ideal if I’d have assembled it myself. I took out my 16-35 and composed this scene that pretty much seemed to frame itself. Even though I had subjects ranging from the fairly close foreground the the extremely distant background, at 21mm I knew I’d have enough depth of field at f11. I used live view to focus on the foreground tree, more than distant enough to ensure sharpness throughout my frame. While I almost always rely on my RGB histogram to check my exposure, my general exposure technique when photographing a full moon in twilight is to forego the histogram and concentrate on the moon. As far as I’m concerned, a shot is a failure if the moon’s highlights are blown (a white disk), but since the moon is such a tiny part of the frame, it barely (if at all) registers on the histogram. What does register is the blinking highlight alert that signals overexposed highlights. When the foreground is dark, I’ll continue pushing my exposure up until the moon just starts to blink (not the entire disk, just the brightest spots). I know from experience that I can recover these blown highlights in post processing. I also know that this is the most light I can give the scene, because the moon’s brightness won’t change as the foreground darkens. (While I don’t blend images, for anyone so inclined it’s quite simple to take two frames, one exposed for the foreground and the other exposed for the moon, and combine the two in Photoshop.) In this case I spot metered on the foreground to ensure enough light to retain color and detail in the rapidly darkening shadows, then used a Singh-Ray 2-stop hard graduated neutral density filter to hold back the sky and (especially) protect against blowing the moon. This is the view looking east from near Glacier Point. 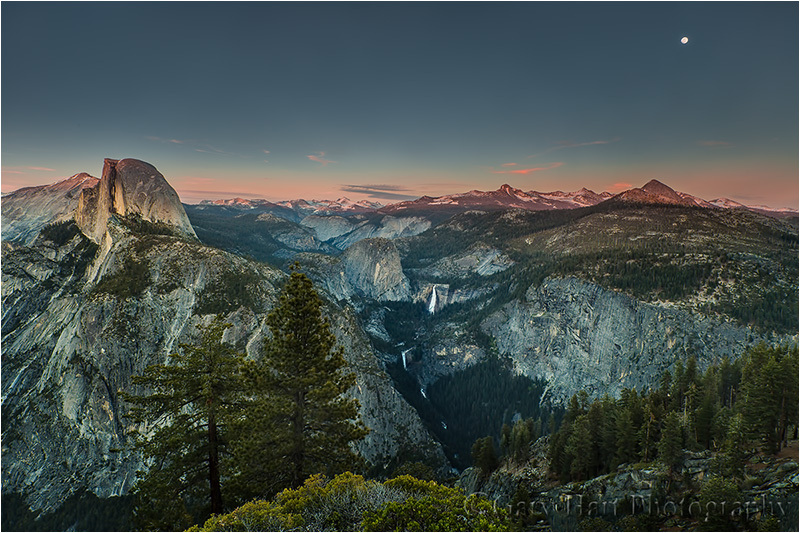 From left to right: Cloud’s Rest (just behind Half Dome), Half Dome, Vernal Fall (below—the white water beneath Vernal Fall is cascades on the Merced River), Nevada Fall (above), Mt. Starr King (triangle shaped peak). When did they put “trains” in? This is a great shot, I like the “palette”, the different take, and the balance over all. Wish I were there. Proof that it is the Photographer, not the camera! I was there with Gary, took the same shot, mine did not look like Gary’s!! Awsome shot Gary. Although, maybe it is the camera, I shoot with a Nikon :-). Just taking in the view at Glacier Point was amazing! However, Gary revised the workshop schedule so that all the group could return the next evening for another opportunity with the full moon at Glacier Point. It is always a privilege to be part of a workshop led by Gary! Thanks, Linda, it was my pleasure! A year has passed since standing in that very spot. Seeing your imagine brings so many wonderful and living memories. Feeling thankful for your workshop all over again. Thanks Gary. A year has passed since standing at the very spot. Your photo brings back wonderful memories. Thanks Gary.